S10E08 - "The Pyramid at the End of the World"
Well, "Extremis" always was going to be hard to top, wasn't it? Including "Extremis", Doctor Who has been tackling the multi-episode narrative in increasingly refreshing ways lately. Season Nine's "The Girl Who Died" and "The Woman Who Lived" found a powerful new way to introduce a vital character, and the three part finale of the same season ("Face the Raven" - "Heaven Sent" - "Hell Bent") took on a multi-story approach that allowed each episode to function independently and still form one fluid narrative thread. It's no coincidence that I gave all six of the aforementioned episodes a perfect score. "The Pyramid at the End of the World", co-written by Steven Moffat and Peter Harness, is the first episode in this current trend that fails to recapture the same dizzying successes. Now, "Pyramid" isn't an actively bad episode by any means, but it represents a notable step down from every episode so far this season - in fact, I think I'd have to go back to "Sleep No More" to find another episode as clumsy as this one. The premise is frustratingly brilliant. The Doctor has escaped the simulation and he's filled Bill in on all of that - shown through a zippy and unique spin on the "Previously..." segment - but now the real invasion begins. A 5000 year old pyramid has mysteriously appeared over night, and it's brought the U.S, Russian and Chinese armies together in potentially catastrophic ways. With the knowledge that this was written by Harness, the man who gave us that war speech, one would be forgiven for expecting something compelling and politically motivated. In the end, though, the pyramid is completely irrelevant. In fact, an awful lot of the episode is pointless, empty and, dare I say, boring. Doctor Who, and the Moffat era especially, is frequently brilliant in its handling of misdirection, but "Pyramid" makes the mistake of telling us how unimportant its central plot thread is and then carrying on as normal. An alien invasion should feel daunting and important and terrifying, but almost all of the scenes here actually focusing on the Monks and their plan fail to register. The episode is more successful in its sub plot - y'know, the one featuring no key cast members until the final act. Confined to a dangerous science lab, Erica (Rachel Denning) and Douglas (Tony Gardner) were hardly game changing characters, but their barely explained scenes in the episode's middle act actually find a sense of enigma, of mystery. Despite featuring faces we don't know doing things we don't understand, their scenes almost always feel more important than those featuring the Doctor or Bill. It creates a sense of confusion within the episode. There's too much going on: the story leaps and bounds through a huge number of sequences but rarely do they feel vital enough to the overall backbone of the narrative. The pyramid plot essentially builds to nothing - the key mystery of the pyramid itself is actually resolved immediately after the opening titles - and the science lab thread mostly feels far too disconnected to the main story to fully come into its own. Eventually, "Pyramid" ties its two threads together, and the result is spectacular. 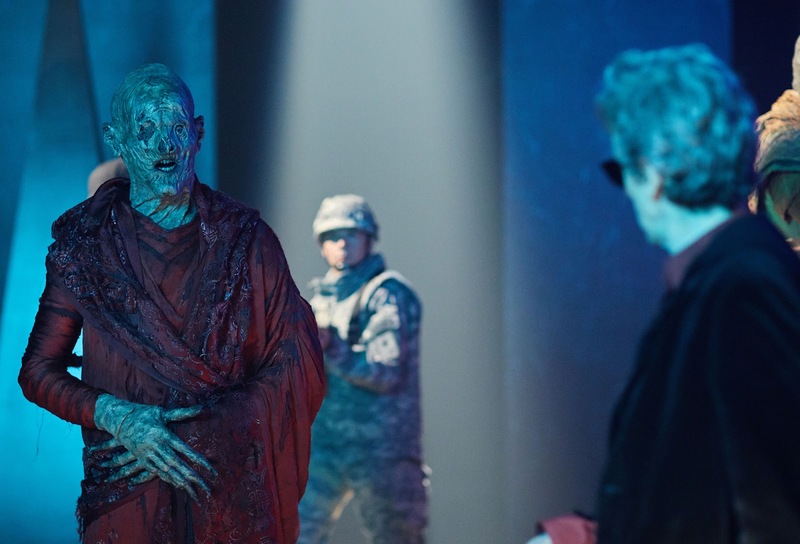 The episode's final act is ingenious in the way it uses the Doctor's blindness as more than inconvenience - it's now a fully fledged plot point. His revealing of the truth to Bill is ultimately what kick starts the Monks' peaceful invasion of Earth, and it's handled so smoothly and so confidently that the rest of the episode feels inconsequential. But that's where the big issue lies. This is going to conclude as a 2 hour and 15 minute story: we're now an hour and a half in and the narrative is lacking urgency and consequence. Next week's "The Lie of the Land" seems to be facing an impossible task - it has to wrap up a story that barely even feels like it's begun. The nature of this story's structure means that "Extremis" remains undamaged by the issues of "Pyramid", but it also backhandedly makes "Pyramid"'s issues more noticeable. This is an episode of Doctor Who that seemingly has far too much going on and far too little actually happening. I'd confidently label this the weakest episode Harness has written for the show thus far. It lacked the wonderful absurdities of "Kill the Moon" and the intense, character driven politics of his Zygon two-parter. This felt very tame in comparison, very laboured and withdrawn. Peter Capaldi and Matt Lucas continue to make a great double act. The "Are you following me?" moment was monumentally stupid, but I can't deny chuckling. Pearl Mackie absolutely nailed Bill's dilemma in the final act. Risk the world and save your friend, or lose your friend and save the world? It isn't even that simple, but Mackie made it look effortless. She's really coming into her own, now. Last week's President corpse definitely wasn't Donald Trump, so that "orange" comment Bill makes in this episode's opening fell a bit flat. Continuity, guys. I'd say it's entirely possible that "The Lie of the Land" will function in a way that irons out a lot of this episode's flaws, but we'll just have to wait and see.